Did you know a cockroach egg sort of looks like a cooked pinto bean, with dozens of cloudy sacs of life inside? I bet you never want to eat pinto beans again. I definitely do not. This is what I contemplated while on the sandy white beaches of the Grotto Bay Beach Resort and Spa in Bermuda. Even as I sipped unlimited banana daiquiris and crystal waves splashed by my feet, my sleep-deprived pupils blackened in fear behind sunglasses. Otherwise, it was a very lovely vacation. 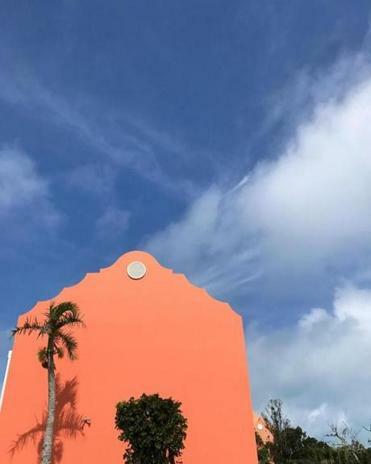 Smack in the middle of America’s Cup, I spent five days in Hamilton Parish at a terribly cute, pastel, 201-room resort that made its Bermudian debut in the early ’70s. It boasts the island’s only all-inclusive package, with metered meals, unlimited beverages, and water sports for $114 a night. If you’ve been to a Bermuda grocery store and spent $18 on a watermelon, you will recognize this as a bargain. There’s a small, but just fine, private beach with a surf shop offering snorkel gear and kayaks. If you hate the sun, then why are you in Bermuda? But lucky you, there are on-campus caves for swimming and spa treatments. It costs a fraction of the inflated nightly rates of downtown Hamilton and is a five-minute drive from the airport, though relentless singing frogs drown out the residual noise. We were charmed by the staff and the ability to order unlimited Rum Swizzles and spent most of our first day patting ourselves on the back for taking a chance on a mixed review resort. Those shrill TripAdvisor reviews were nothing more than uptight tourists. I wondered if there should be a “Mean Tweets”-type segment where my new best friend, the resort’s guest services guide, read negative reviews for YouTube. But — they come at night. Following a feast of steak frites and Dark and Stormy cocktails at Palm Court, one of the hotel’s three dining options, we were ready to settle in when the first chicken egg-size cockroach sauntered in from behind the dresser. I don’t mean to provide a narrative to a nonvocal creature, but this enormous, evil beast had absolutely been there before. It confidently approached as I felt the thump of heart palpitations rising in my chest. Soon, its associates joined. My boyfriend managed to stamp them out with a copy of the Economist (if you happen to have a spare edition, please let us know) and trapped another under a glass as collateral before we rang guest services. I spent half of the remainder of our trip wondering how much it would cost to change hotels. I spent the other half of that time wondering whether most American travelers are intolerant of native critters. Monster-size cockroaches are indeed common in Bermuda, as are the slender lizards that might be less welcome if they weren’t such an on-brand turquoise ombre and the hotel’s pseudo-resident feral cats, which I found to be the best amenity of all. Grotto Bay offers a round-trip shuttle service to Cooper’s Island Nature Reserve, where, if you are not willing to encounter multilegged locals, you could miss the most spectacular hidden beaches. The famed pink sands of Horseshoe Bay are easily accessible via a 45-minute ride by public transit (a bus pass is included in the all-inclusive package), but these quiet coves are the spectacular tranquillity that desktop computer screen backgrounds are made of. The cockroaches did not appear again, though one of the many live chickens that roam the resort joined us for lunch. “We try to shoo them away, but then days later we see them reappear with little baby chicks in tow,” one exasperated staffer said with a laugh, replacing the cocktails our dining guest splattered to the ground. We laugh, too. We’re one with nature now. By day five, the cockroach invasion seems like a distant memory. Instead, we’re happily snapping off aloe leaves from a plant in the hotel’s front lawn at the advice of our concierge. New arrivals watched, horrified, as we ripped open leaves and slathered our sunburns in goo. This is Grotto Bay at peak all-inclusive. Nature, too.